This was supposed to be our topic in March, but since the MUG session got cancelled because of a snow day, we included it this month as well! Mandarin comes with hundreds of reports pre-installed, and they are customizable. I have done quite a bit of customization for folks over the years, and I usually modify an existing report and save it with a new name, which gives you even more reports to wade through to find just what you need! Many folks are reluctant to either delete reports they never use or to move them anywhere for fear that they might never find them again or else that it's somehow against protocol. But fear not! You CAN re-organize or rename your reports in a way that makes sense to you and it won't affect how they run. Once you have this folder created, you can either copy reports that you use on a regular basis to this folder, cut and paste them, or you can open the report and save it under a different name in this folder. Any of those will work! And if you DO manage to delete some of the original reports, never fear - here at the SLS we have all the original reports and can restore them for you whenever you say. Generally speaking, if you see that a report is BY something ("ByGrade," "ByTeacher," etc. ), that's how it's grouped and/or sorted. If it's FOR something ("ForSelectedRangeOfDays," "ForSelectedGrade," etc. ), then it means you'll have to specify criteria when you run the report. Oh, and the ".rpt" indicates that it's a Report Tool Report. Don't change that part, if you rename things! As you can see, I usually use spaces, and also use "A" or "An" to start; it brings those things to the top of the list. You can also number them - notice that the one starting with numbers comes to the very top! So if you've got something that you use every week or more, name it starting with the number 1 and it will soar to the top of the list. The bottom line - name them, sort them, organize them in whatever way makes the most sense to YOU! Messages in circulation can be very useful things. They can jog your memory about items (want to change that spine label when the book comes back? Put a message on it!) or patrons ("Mom doesn't want Junior to take out any Harry Potter books"), and can be useful for substitutes, too (as in the latter example). Attaching them is pretty simple - here's a cheat sheet to help you if you've never done it. Detaching them is also pretty simple (see the cheat sheet) - just don't forget that you have to click "Accept" after you click "Detach!" When you open the messages dialog box, any messages attached to that patron/item will have a check mark in front of them. To remove them, click "Detach " (that will remove the check mark - you can also remove the check mark by clicking on it). Then click the "Accept" button and the message is removed. Messages actually get stored in the transaction database (along with loans, renewals, holds, reserves, bookings, etc. ), so the messages need to be removed from any patrons or items before the record can be purged. I've had many instances where folks have called me saying that they returned any books, forgave any fines, and nothing comes up in circulation under the patron's name, but whenever they tried to purge the patron's record, cataloging tells them that there are still open transactions. When I've looked into this, 9 times out of 10 it's because there was a message attached and removing the message from the patron (or item) then allowed the corresponding record to be purged. There are a couple of reports you can run to find what messages are attached to patrons or items in your catalog. 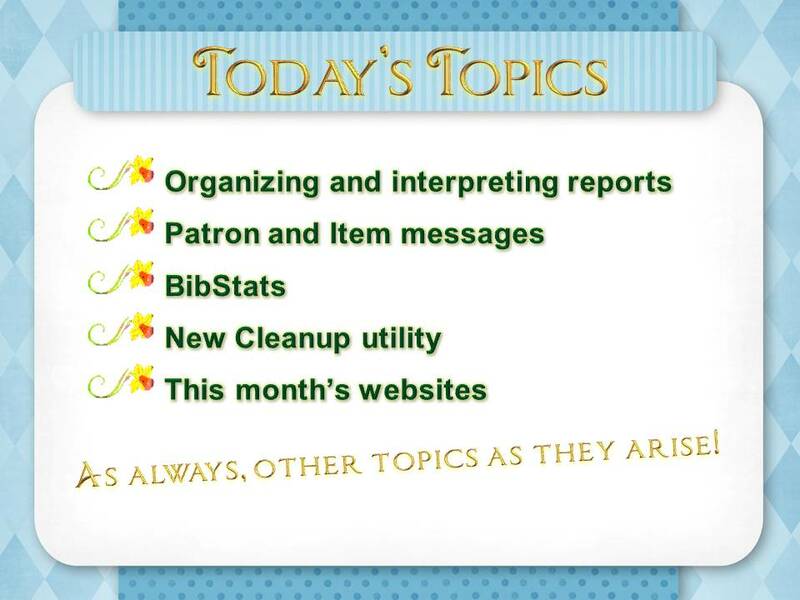 For items, look in the Bib & Items List folder for "Item-List(MessagesByTitle)" and for patrons look in the Patron Lists folder for "Patron-List(MessagesByPatron)" or one of the other options, i.e., Messages By Patron for Selected Grade, by Patron for Selected Teacher, etc. As I said, messages CAN be useful, but they're not necessarily the only or best answer. Depending on what you're trying to accomplish, setting up groups in group editor to restrict loans to a specific group of items or patrons might be a better choice, especially if there are more than a few items/patrons to which you'd have to attach a message. Mandarin has a couple of really nifty new utilities out. The first one we looked at is "Bibstats" - it's a simple utility that analyzes your collection and tells you the top circulated titles. You can specify how many titles you want to list (it defaults to 30), whether you want to see the "all-time" or look at just the top items for a specific date range. You can also choose to run it just on a specific item group. Below, for example, is how I recently set the Bibstats up to see what the top 20 Audiobooks (which for us includes Playaways) are that have circulated this school year. Takes a few minutes to run, but interesting to see the results! Note that if you have multiple holdings attached to a single bib record that it will include all the associated holdings. So if you have a bib record that has three holdings attached and holding A has circulated 4 times, holding B 3 times, and holding C twice, that title will come up with 9 loans. If you'd like to use Bibstats, you can download it and install it from the Mandarin website (unless, of course, you're in one of the districts with the Secure Desktop Initiative, in which case I'll have to help you!). You'll need your customer number to install - that should have been on your online database sheet that you got at the beginning of the year. Included in this new release are two new functions: the "Find Inactive Patrons" function allows you to look for patrons whose records are marked for deletion, who have never had a loan, or who have not had a loan since a certain date. Once you've set your criteria, you can then easily delete those records, save the information for those records to a file, or just save a list of the barcodes. The new version also incorporates the Transaction History Purge utility, which was previously a separate utility. This purges transactions in your database that are from before a date which you specify. WARNING: USE WITH THE UTMOST CAUTION! Make sure that you REALLY want to get rid of old transactions; if you remove them, you can no longer get any statistical data associated with them. So if you plan to do some kind of analysis of your circulation patterns over the years and you use the history purge - you won't be getting any data at all for comparison before the date you specify in the history purge. If you want to know a little more about the cleanup utility, here's a video that runs about 10 minutes. Sorry it's not the very best quality; when I have time I will re-do it! 5. This month's websites can be found here. Till next time, then! Hope you can join us on May 5th for the last session of the school year. Our topic will be "Preparing your collection for a new school year." Instructions: Type your name and your comments in the boxes provided below. The location box is optional. All comments must be approved by the owner of this website before they are displayed in the comment section. The website owner has the right to edit or delete any comment posted to their blog.